Singapore-listed ground handling and in-flight catering services provider SATS Ltd and Malaysia's low-cost carrier AirAsia have signed an agreement, which will give SATS access to the Malaysian ground-handling market. The deal involves both firms owning an interest in each other's ground-handling units as they expand services across the region. SATS will acquire a 50% stake in AirAsia's Ground Team Red Holdings (GTRH) in exchange for its 80% stake in SATS Ground Services Singapore (SGSS), along with S$119.3 million in cash, SATS said in an announcement to the Singapore Exchange. SGSS is a new entity formed to serve customers at Changi Airport's recently opened Terminal 4. Both companies will be responsible for growing the ground-handling business in their respective markets and will explore expansion into Indonesia, the Philippines and Thailand soon, the companies said in a joint statement. AirAsia noted in a filing to the Malaysian stock exchange, that the partnership with Sats will foster greater efficiency and cost savings for AirAsia's ground-handling operations. The joint statement further said that the partnership "will also support the rapid growth of AirAsia towards 500 aircraft and 150 million passengers by 2027 by combining AirAsia's expertise in providing quick and low-cost turnarounds with industry best practices and innovative technology developed by SATS for passenger and ramp handling." The new partnership will give SATS, which already owns a 4% stake in the largest flight caterer in Malaysia, Brahim's Sats Investment Holdings, access to the Malaysian ground-handling market, said SATS. SATS president and chief executive Alex Hungate said the expanding fleet size - with 41% of the demand for new aircraft over the next 20 years coming from the Asia-Pacific - represented a huge opportunity for the firm. Following the announcement of the joint venture with SATS, AirAsia Bhd on Tuesday said it plans to sell more stakes in non-flying businesses to fund special dividends to shareholders. 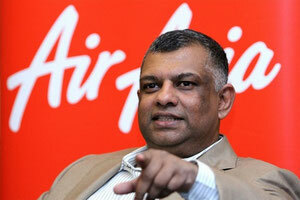 The low-cost carrier, which expects S$119.3 million (US$87.7 million) in proceeds from the SATS deal, is close to selling some or all of its aircraft leasing arm and its remaining 25 percent stake in a travel booking joint venture with Expedia Inc, Reuters quoted its founder and Group CEO Tony Fernandes as saying. The airline will also consider the sale of stakes in its food, engineering and duty free businesses in the future, although no talks on those have begun, Fernandes said.